Book a skilled lawn pro in Newport News. Backed by a total satisfaction guarantee and amazing customer support. 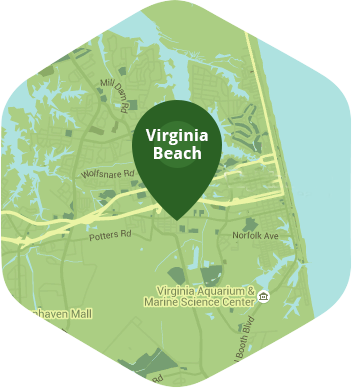 Newport News is in close proximity to important places in Virginia. Jamestown and Colonial Williamsburg can help you get your history fix, and Virginia's beaches help you to get your fill of the sun and surf. With all of those exciting things so close, who wants to take the time to get their lawn work done? If you find yourself in this dilemma quite a lot, then you need to find out how Lawn Love can help you. Lawn Love has assembled one of the most awesome lawn care teams in the business! Our skilled, fully bonded and insured lawn care technicians have the know-how and the experience to create and maintain a lawn you can be proud to come home to. We can take care of all the weeding, seeding, mowing and maintenance that your lawn requires - all you have to do is find the time to call! Give Lawn Love a call today at 757-301-4036 or get our two-minute quote, and find out how we can give you a lawn you'll love, while freeing you up to enjoy life. The flowerbed was completely overrun with weeds, Shawn did an exceptional job of clearing it 100% and bagged everything. Can’t thank him and LawnLove enough for the help. Forgot to trim the 2 bushes out front. Other than that it looks great. Sherman does excellent work and I look forward to his careful attention to our property throughout the spring, summer, and fall. Thank you so much. Thank you Sherman for an excellent service. He was very professional and knowledgeable. He did a great job! We were very happy with the results. Thanks!!! He was very nice, and did a great job. I knew he had been immediatley! Steven Gray's work was excellent. We look forward to Steven taking care of our yard on future visits. Thanks much! Steven did an amazing job and was friendly and professional! Cliff removed the leaves from our overgrown Azalea bushes and it was very much appreciated. Steven goes the extra mile in taking care of business always does an outstanding job. My lawn really appreciates Steven efforts Personally I think he is the best out there, Thanks Steven. I would like to request Cliff for all my services. Thanks for the service you provided. My yard always looks so good. steven is such a nice man and I have really appreciated him, and his understanding of what i need just by looking at my home and yard. I really hope he will still take care of me next season!!!! They did a wonderful job yesterday I really need to see my grass look beautiful again. Best job. Please try to schedule him for me in the future. Shoot I missed you but the yard is beautiful! Thank you! Thanks for cleaning up the leaves from the storm! It was going to rain but he came anyway! I appreciated the effort! Thank you! Ryan thank you for honoring your contract and being a man of your word. Not too many take pride in that these days and it was refreshing to finally coming home yard and not a jungle. The company should contract more like you. I didn’t meet him but the lawn looks great. Will most likely set up regular cuttings in the spring. The lawn looks great! Thank you for a very professional job! Really nice to have you around. I really like jonathon a lot and my lawn looks beautiful! Thank you so much! Rated 4.8 / 5 stars in 2,120 Newport News customer reviews. It looks like the expected precipitation in Newport News is 0.68 inches, which means your lawn got a nice soaking—leave those sprinklers off today. Dusk and dawn are the best times to water your lawn (the sun will rise at 6:18 AM and set at 7:49 PM today in Newport News). Here are some average lawn care prices for homes in Newport News. Average lawn size 5,334 sq. ft.